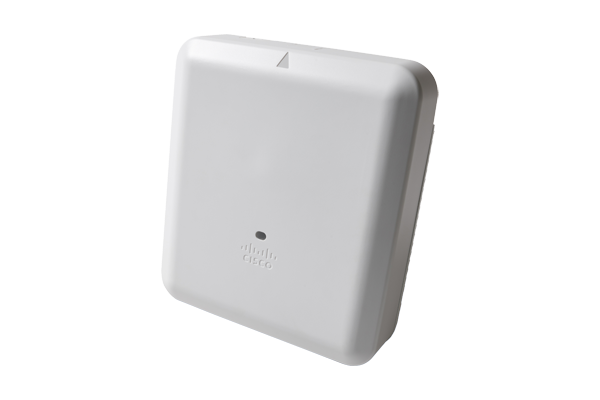 Feast your eyes on that little Chiclet-looking thing… No image can do justice to Cisco’s latest powerhouse AP. That innocuous looking image represents a full 5.6 pounds (2.5 kg) of all kinds of Cisco’s latest technology in the company’s new 4800-series access point. You got 4×4 802.11ac Wave 2 radio wizardry, a built-in hyperlocation antenna array, and BLE beacon capability. And… regardless of whether you buy into Cisco’s DNA Center story, the new 4800 has a lot of DNA-oriented functionality. It’s big in size, functionality, and at least for a while- price. You don’t need me regurgitating the entire data sheet- that can be viewed here. You’ll also want to hear the full story of the 4800 and DNA Center when you get a chance, because it’s nothing less than fascinating. (My own take: DNA-C might be revolutionary- but I’d rather see new controllers with a new WLC operating system rather than bolting DNA-C’s future-looking promise onto yesterday’s fairly buggy wireless parts and pieces. That’s just me speaking from experience- take it or leave it). I’ve seen the 4800 with the outside cover removed, and even that is profoundly thought-provoking when your eyes take in how much is really going on with the various antennas- get a look at that if you can (I’m not comfortable sharing the images I’ve seen, not sure where NDA starts and stops on that). So a huge access point story is afoot, and I applaud Cisco on that bad-lookin’ mammajamma. But I also got sparkley-eyed by something else fairly nerdy while looking through 4800 materials and links to other links. and it took me way back to my own early days of wireless. 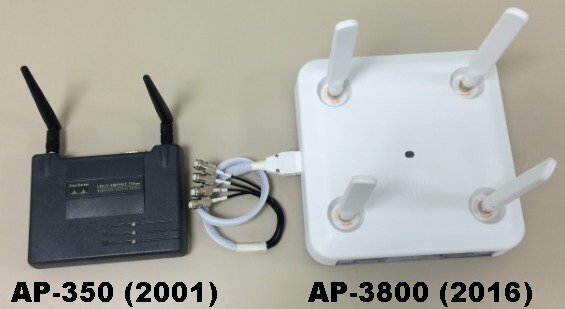 My WLAN career started with a 4-AP deployment of those 350s, which ran the VxWorks for an operating system and had only 802.11b radios… (cue the flashback music here). As I read that over, my mind goes back to all of the Cisco APs that have come and gone in my own environment- 350, 1130, 1200, 2600, 3500, 3600, 3700, and our latest in production, the 3800. In this list, there have been multiple models from the different series of AP leading to the thousands of APs that are now deployed in my world. On the operating system side, VxWorks became IOS, and in turn AireOS. Now we have AP-COS on the latest Wave 2 APs (don’t Google “AP-COS”, most of what comes back is bug-related, sadly). It’s interesting to reflect back, on operating systems, PoE, radio technologies, and feature sets. As Wi-Fi has gotten more pervasive, it has also gotten more complicated on every level. Seldom is the latest access point THE story any more, now it’s about all of the features that come with the whole ecosystem that the vendor wants that access point to operate in- if we as customers buy into the bigger story. I’m not passing judgement on anything with that statement, or intentionally waxing nostalgic (well, maybe a little bit). It’s pretty neat how one image or a certain document can suddenly flash your your entire wireless history before your eyes. This entry was posted in Cisco Networks, Code bugs, Wi-Fi, Wireless Networking, WLAN and tagged AireOS, Aironet 4800, AP-COS, DNA Center, PoE, VxWorks on April 19, 2018 by wirednot. I realize I’m beating the 11ac thing up pretty good lately, but I think I finally hit on what bugs me about the way the new hot technology is being brought to market. What I’m about to describe is more of a BAN issue (BAN=BigAss Network, where APs are counted in the hundreds or thousands) and not so much of concern for smaller environments. 802.11ac is being delivered in rather bizarre (for the customer) “waves”. Wave 1: Data rates to 1.3 Gbps. You’ll do fine (for most new first wave APs) with a single Gig uplink, and many new APs will work on 802.3af POE, not yet requiring .3at. Fine, good. No real squawks. Wave 2: You get the joy and cost of recabling your environment to add a second Gig uplink, doubling the number of switchports in use for the WLAN and configuring Etherchannels, and depending on what vintage switches you have- upgrading them for latest POE standard, all to help get to data rates likely to realistically be between 2 and 2.5 Gbps best case. In simplest terms- I don’t want to use two cable runs. And I don’t want the complexity and risk of 4000 more Etherchannels for my APs. But I still want the benefits of 11ac Wave 2. No feature bloat. May not even need to be VLAN aware. Spare me the lecture that there is no such thing as 2 Gig Ethernet, and that what I’m asking for would be based in no existing standard. The WLAN industry has long since turned it’s back on standards and interoperability, which is why vendor lock prevails. Other than PoE and what comes out of the antenna (and even that can be a dubious discussion), the mention of standards is a joke in the WLAN industry as each vendor authors their own technical magic. So be it- I just want new magic and don’t care that it’s not exactly Ethernet in the middle. I’m OK feeding this new component a 10 GB uplink that it then divvies up into auto-configured 2 Gbps AP uplinks of some proprietary protocol. Or feeding it 2 single-gig ports on my wireless management VLAN that it then magically muxes into a 2 Gbps, big powered uplink that connects via a single wiring run (of excellent quality, of course) to each AP. At that point, all of MY work was done in the closet, and I didn’t run a slew of new wires for my wireless network. If we don’t get something disruptively creative on the wired side to go along with 11ac, pretty much any TCO discussion on new 11ac ownership presented by WLAN vendors will be incomplete at best, and poppycock at worst. I’ve seen both announced and unannounced 11ac products- and the prices are pretty steep (well, except for Ubiquit-). But we’re supposed to believe that 11ac lets us draw down the wired network considerably, and so be willing to buy into a higher premium for wireless. But… adding lots of new switchports and cabling runs (not trivial in many environments, can add hundreds of dollars in cost to real TCO for each AP) has to be considered. As a customer, I feel OK asking- because the customer is always right (well, except when they’re wrong). So… when will my new non-standards-based 2 Gbps mega-PoE switches arrive? This entry was posted in Wireless Networking and tagged 11ac, 802.11ac, Ethernet, Gigabit Ethernet, Lee Badman, Matthew Gast, PoE, Ubiquity on May 17, 2013 by wirednot.